At their core, a lot of movies are about characters trying to maintain relationships with their close friends, like Captain America: Civil War, Bridesmaids, or Toy Story. But those movies rarely end with one of the friends completely and thoroughly ruining another friend’s life—although Civil War actually comes pretty close. 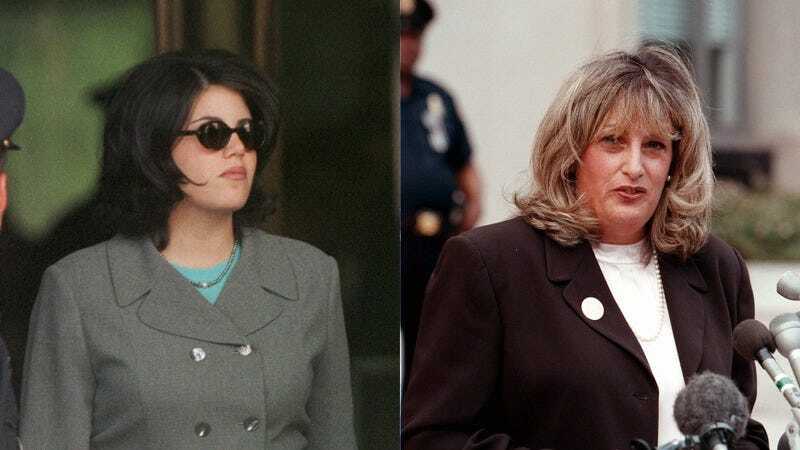 Amazon is now preparing to make a movie about a tragic friendship like that, but it actually concerns two people who used to be even more famous than Iron Man and Captain America: Monica Lewinsky and Linda Tripp. According to Deadline, Amazon Studios has picked up the rights to Linda And Monica, a movie about the friendship between the eponymous “D.C. pals” that fell apart when Tripp exposed that Lewinsky had been having an affair with President Bill Clinton. Later claiming that she was trying to protect her friend from ruthless politicians, Tripp secretly recorded Lewinsky talking about her relationship with Clinton and gave that recording to Kenneth Starr, a special prosecutor investigating the Whitewater scandal. After that, the affair was exposed and Lewinsky was thrown under the bus by pretty much everybody, virtually destroying her life and definitely destroying her friendship with Tripp. Linda And Monica is partly based on “the actual conversations” between the two women, so it’ll even have that sparkle of historical accuracy. Based on the Deadline story, it doesn’t sound like a director or any cast members have signed on yet.